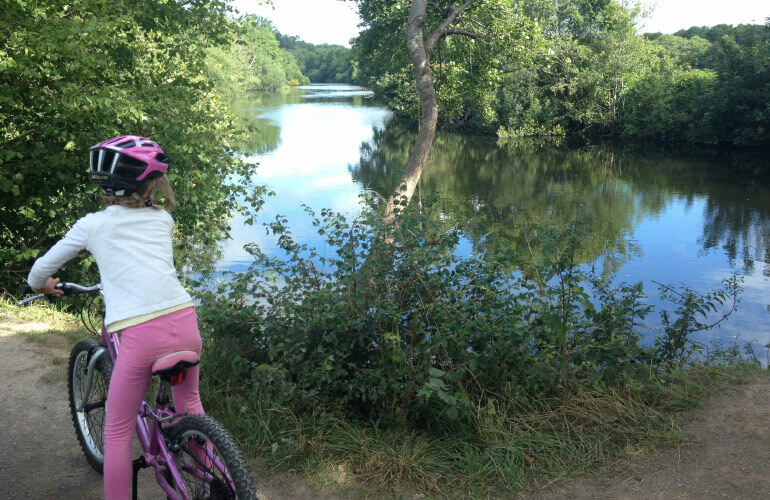 A perfect day out for active families offering glorious views of the River Dart along ancient lanes, water meadow marshland and quiet woods. The Dart Valley Trail, on the other hand, is a walking route from Totnes to Dartmouth, which means cycling is only permitted in certain sections. This route can, of course, be used as a walking route. The Dart Valley Trail, on the other hand, is a walking route from Totnes to Dartmouth, which means cycling is only permitted in certain sections. 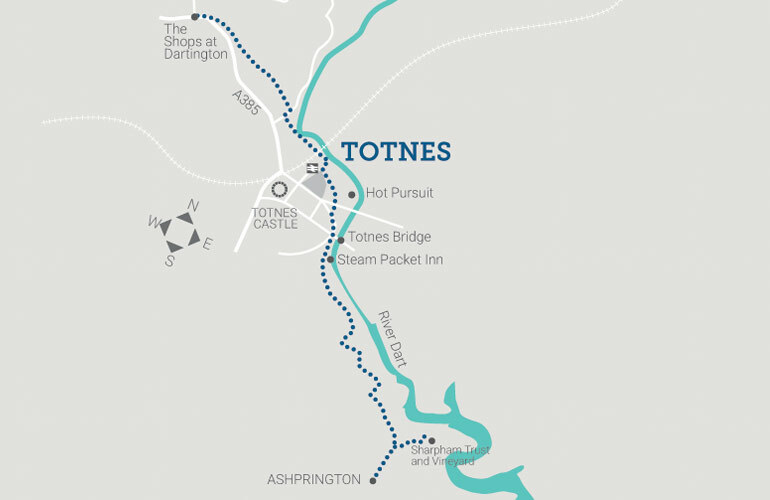 The Dart Valley Trail is a walking route from Totnes to Dartmouth offering the perfect, active day out with glorious views of the River Dart along ancient lanes, water meadow marshland and quiet woods. Cycling is only permitted in certain sections. This walk is classed as hard by South Devon AONB. 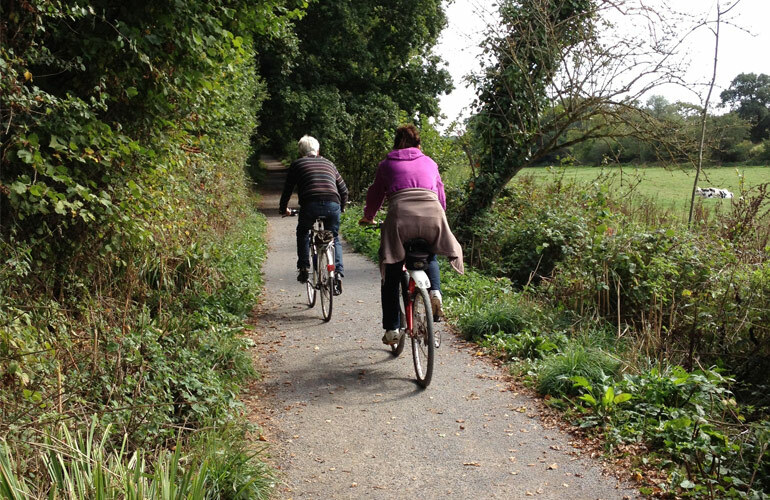 The Dart Valley Cycleway is a mostly off-road route which passes through Totnes mid-way, between the villages of Dartington and Ashprington. There are rewarding views and interesting places to visit on this trail which, though strenuous in parts, has some level sections too. 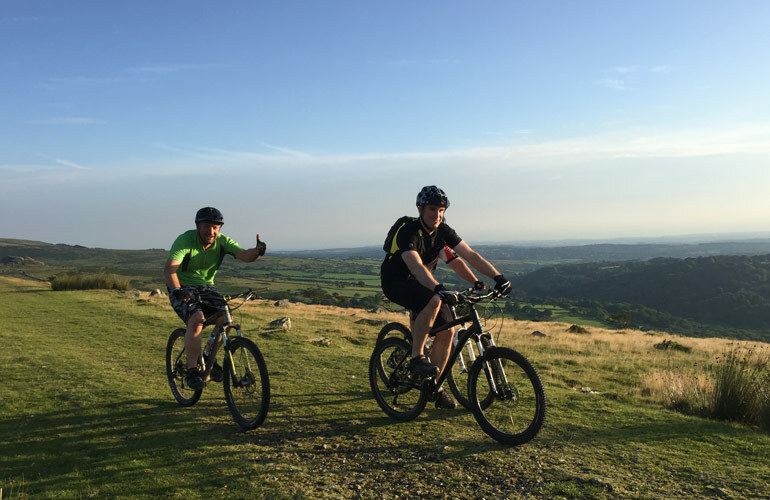 The route is equally as good for walkers as cyclists but be mindful that there may be bikes around. When you get to Sharpham, you can get refreshed at the Cellar Door Kitchen at Sharpham Vineyard (open April to October) or visit and shop at Sharpham Wine & Cheese. If walking, why not vary the route to and from Ashprington by taking the cycle route on the outward journey and returning by the footpath? A part of the path is carefully designed to be suitable for people with disabilities. For more information click HERE. 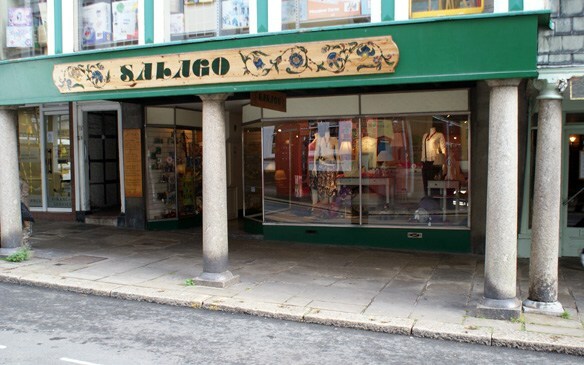 Salago is a family run independent store in the historic town of Totnes, offering thousands of products from fashion and footwear to toys and games. Among other brands we stock Shepherd sheepskin and wool slippers by Haflinger and Wesenjak, bags, purses and accessories from eco fashion brand Thought (previously named Braintree). Our toy section includes brands such as Ostheimer, Holztiger, Bigjigs and John Crane. We are also stockists for Lyra Pencils and Stockmar art materials including watercolours, wax crayons and modelling beeswax. The independent shops and markets in Totnes are pivotal to the town and have a reputation as some of the best and most unusual in Devon. The general market takes place on Friday and Saturday throughout the year and is held on the Civic Square, just off High Street in the centre of the town. Here you can buy anything from vintage boxes to fresh fi sh from a fishmonger. A collectables and flea market also takes place in the Civic Hall, above the Square, on Fridays. The early bird bags the best market bargains! Seed, food and clothes ‘swap’ events can also take place. 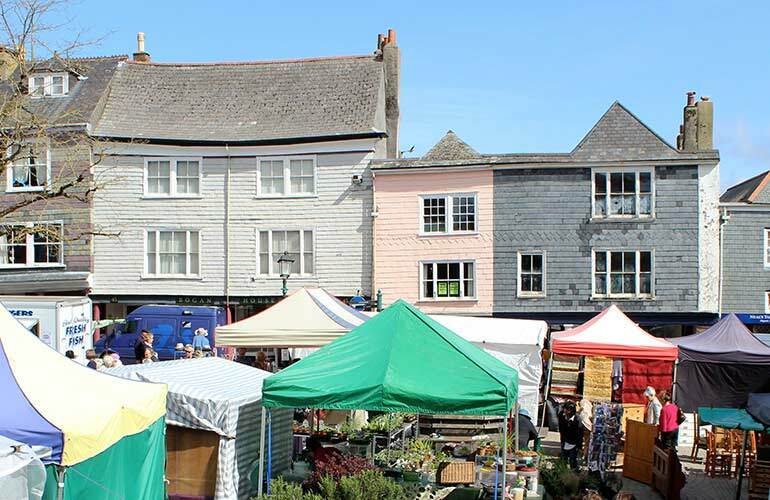 One of the best places to try the delicious delights of what Totnes and the surrounding area has to offer is at the Totnes Good Food Sunday Market. Held on the 3rd Sunday of each month throughout the year, this award winning market has a reputation for offering a wide range of quality produce from dozens of local producers. Whether you’re looking for a tasty souvenir to take home or a unique gift, there’s plenty to keep your taste buds happy. There is no better place to talk food, taste food and buy food! totnesgoodfood.co.uk. Winner of the Gold Prize for Glass in the ‘craft&design’ magazine awards, Steve Robinson is an established fused glass artist and designer whose work is instantly recognisable and collected world-wide. A pioneer in the use of glass enamels, Steve has developed specialist techniques to create pieces bursting with texture and colour. He is particularly well known for his unique glass splashbacks, made to measure. Browse in Steve’s vibrant Gallery which displays a collection of his latest pieces, from bowls and small collectable and gift pieces through to wall hangings and larger-scale features. Seascapes and coastal colours inspire much of Steve’s unique work. Commissions are also undertaken. Opening times are Monday to Saturday 10am to 5pm all year round. 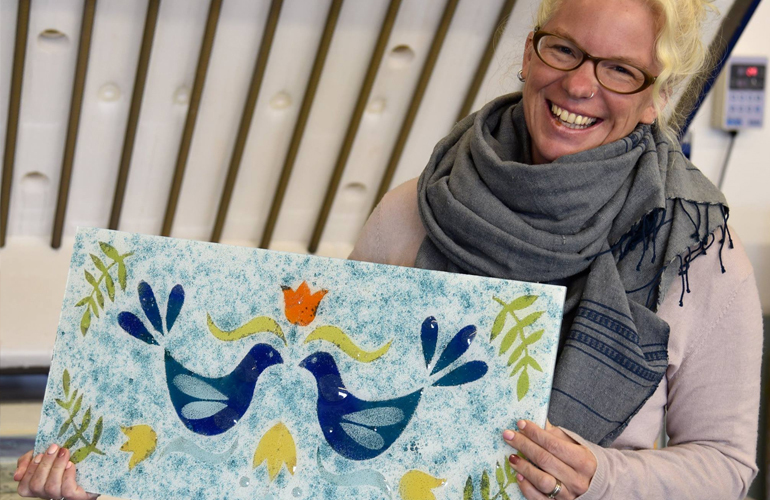 Learn the wonderful art of glass fusing. Take home a unique souvenir to remember your visit by. Award winning artist, Steve Robinson, shares his tricks of the trade in a workshop designed for all abilities – no experience required. Evening taster classes and full day workshops. Expert tuition and all materials provided. Book online or by phone in advance. Workshops are held in Steve’s spacious and fully equipped Studio in Ashprington, just a few minutes from Totnes.